Regular readers of my blog will know that misleading claims and images in beauty advertising/packaging really gets my goat, so I was interested to read the news this week that the ASA (Advertising Standards Authority) has banned two adverts by beauty company L’Oreal Paris, which owns Lancome and Maybelline among its powerhouse of beauty brands. Adverts for Lancome Teint Miracle Foundation (featuring A-lister actress Julia Roberts) and Maybelline The Eraser Foundation (featuring supermodel Christy Turlington) both came under fire by Liberal Democrat MP Jo Swinson, who complained to the ASA that the retouched images within each ad were misleading to consumers, because of post-production digital retouching that exaggerated the results of the beauty products. The subject is particularly close to Jo Swinson’s heart as she is co-founder of the Campaign for Body Confidence and believes that these kinds of images put pressure on young women to conform to unrealistic ideals of beauty. While L’Oreal strongly denied the claims in both cases, the nail in the coffin for Lancome was when they refused to supply the ASA with the original pre-production photo of Julia Roberts, which smacks of a guilty conscience. 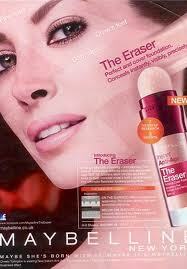 Meanwhile in the case for Maybelline’s The Eraser foundation, L’Oreal argued that the image had only been digitally re-touched ‘to lighten the skin, clean up make-up, reduce dark shadows and shading around the eyes…’ Surely by retouching out dark circles for a product that claims that it ‘conceals instantly, visibly, precisely ... covers dark circles and fine lines’, it is directly misleading the viewer? Complaints to the ASA about L’Oreal adverts are nothing new; last year one L’Oreal campaign alone (starring Cheryl Cole) resulted in 40 complaints to the ASA… all of which were dismissed. So it is significant then that the ASA felt it necessary to uphold the complaints about the Lancome and Maybelline ads and ban them from future use. L'Oreal shouldn't even feel the need to retouch their images so heavily - they invest years in R&D to create products that work (in the ASA's statement about Lancome it acknowledged that 'the pictures supplied from laboratory testing were evidence that the product was capable of improving skin’s appearance') and they have the luxury of huge budgets to use natural beauties such as Christy Turlington and Julia Roberts within their advertising - hardly poster girls for bad skin. I am not against retouching in the slightest; my boyfriend is a Retoucher and I see firsthand the difference between images before and after retouching and the immense improvement it makes. But I think it is important that retouching beauty images is done within the context of what the product claims to do; so for instance in the case of Maybelline The Eraser, by all means use retouching to tidy up stray hairs, remove smudged make up, etc, but don’t use retouching to remove from the image what the product claims to do by itself. Otherwise surely it is testament to the fact the product doesn’t do what it says it does? I also think that disclaimers should be banned from beauty advertising altogether. If a mascara advert needs to claim in the smallest print possible that actually the lashes in the advert look great because they are false lashes, or if a hair styling product promising to volumize hair has to quietly declare that the model is wearing hair extensions, then this to me says that the advert is misleading, disclaimer or no disclaimer.